In the seven years since the downturn in 2009, Denver’s retail market has tightened considerably from the high of nearly 10 percent vacant space. 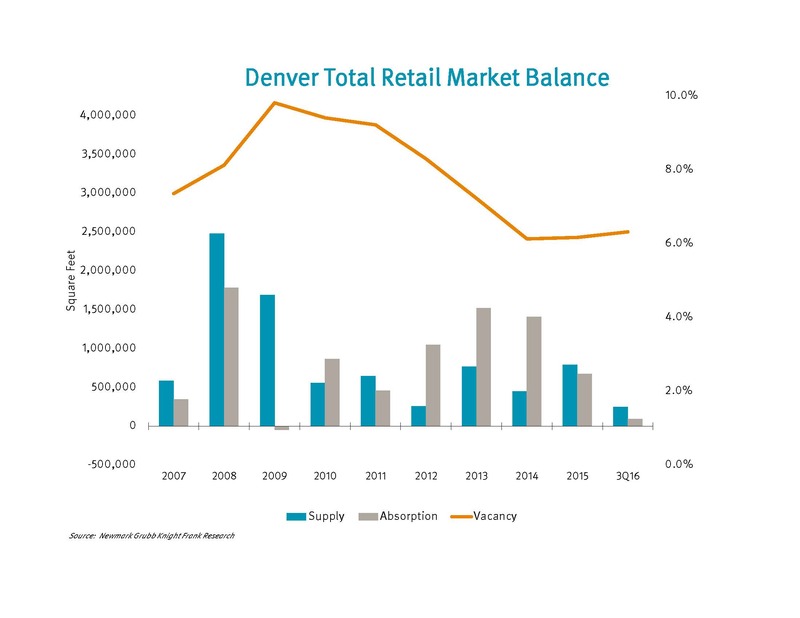 Despite an improving national economy, corporate closings have continued – notably Safeway in 2015 and Sports Authority in 2016 – adding to vacant space in the Denver market. As a result, the third quarter finished with absorption of negative 128,000 square feet, and year-to-date absorption was stable at 95,000 sf. However, the Denver retail market ended the third quarter with a healthy vacancy rate of 6.3 percent. Typically, after the Christmas retail season, struggling retailers make hard decisions, and 2017 is no different. The Limited filed for bankruptcy and closed all locations nationally. Kmart and Sears announced upcoming closures of underperforming sites, while department stores like Macy’s and Kohl’s are shuttering underachieving performers following disappointing holiday sales. While the area is experiencing only moderate exposure from these closures, Denver’s bifurcated retail market offers its own opportunities and challenges. In many ways, Denver retail is a tale of two markets. 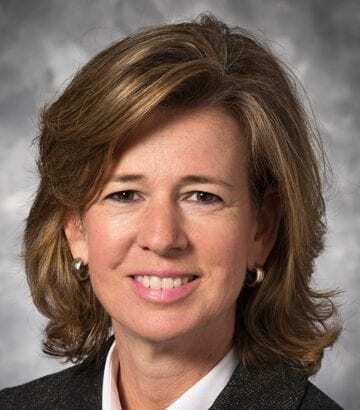 Because of limited new supply, there is high demand for second-generation space in well-located, Class A retail centers, which are full and thriving. Many national retailers cannot find the prime space they require to expand in or enter the Denver market, so they have no option other than waiting for the completion of new product. Despite competition for Class A space, Denver continues to attract international retailers (IKEA, Uniqlo and H&M) as well as national ones (Whole Foods’ flagship store, Trader Joe’s, Cabela’s and Alamo Drafthouse Cinema). Conversely, aging Class B and C centers with poor demographics, often with vacant anchor space, continue to be challenged. As the retail shopping landscape changes, unproductive locations and destinations that have lost its vibrancy will be transformed. What is changing the face of today’s retail? Startups are augmenting traditional retailers. What distinguishes a startup enterprise? Generally, these emerging companies find new ways to reduce the needed capital investment, allowing for a quicker market entry. Examples include food halls and markets, booth rentals and pop ups. In Denver, this concept has taken off with several new food emporiums – The Source, Avanti and Denver Central Market are all making waves with collective spaces offering diverse options and social aspects. This model offers a testing ground for new concepts and menu items, and it appeals greatly to the millennial set, which craves social experiences as well as innovative food options. E-commerce continues to push retail concepts to evolve. Despite concerns that e-commerce would eliminate brick-and-mortar retailers, today’s trending retail is evolving from an online-only presence to actual establishments – essentially “click to brick,” and include expansion of lines, not just hard and soft goods. Examples include Fabletics, Omaha Steaks, Lumen Optical and Amazon, which perhaps is the biggest click-to-brick success story thus far with a new concept test store to open in Seattle this year. The newest evolution is grocery offerings – Blue Apron, Hello Fresh and GroceryBabu (delivered by Amazon) – that deliver fresh ingredients and recipes to your door. This concept is gaining momentum in major markets like Denver. Conversely, Walmart’s expanded online presence is an example of completing the cycle “brick to click.” The megastore is working hard to offer more value to customers, providing in-store pick up and many items online only. The company also is pushing its presence in select urban markets with designated delivery lockers designed expressly for multifamily groups – providing more convenience and security along with a greater offering of products. Amazon also is testing this idea. Today’s most innovative retail concepts center on saving time and money, and creating experiences for customers. Closely integrated, which allows for more “free time” – by taking advantage of Blue Apron’s fresh food offerings, for example – leads to increased opportunities for experiences and entertainment; two ideas highly valued by millennials and young urban professionals. These concepts are manifesting in activating alleyways, creating walkability and providing interesting versatile spaces with thoughtful co-tenancy. Examples include Larimer Square, Union Station, Dairy Block, Denver Central Market, Avanti, The Source and essentially all of Lower Downtown and River North. Obviously, downtown Denver is prime real estate for walkable, active and versatile spaces. 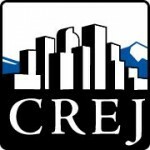 Commanding the market’s highest rental rates north of $40 per sf – as does Cherry Creek North – the central business district is a small, 3.6-million-sf “landlocked” submarket characterized by churn. Closures and relocations occur frequently, but these vacancies are quickly filled. Drum tight, the CBD has a 3.8 percent vacancy and, as such, absorption was flat in 2016 – it’s hard to absorb what isn’t available. New supply tends to be limited to ground-floor retail in office or multifamily projects or redevelopments like Union Station. Despite these constraints, the CBD offers an exploding restaurant scene, the addition of international retailers H&M and Uniqlo, grocery stores including a new King Soopers and the under-construction Whole Foods flagship store, and ongoing revitalization in the LoDo and RiNo neighborhoods.